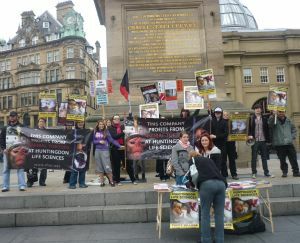 Newcastle Animal Rights Group in support with Vegi North East, SHAC Birmingham, SHAC Leeds, Hull Animal Rights along with numerous other animal rights groups and residents of Newcastle marched against vivisection on Octoboer 9th in the city centre of Newcastle before proceeding to demonstrate against top HLS customer Sanofi Aventis. Activists met at Newcastle Civic Centre for 12 pm and then set off at 12.45pm armed with banners and placards, megaphones and loud voices making a visual and noisy march on Northumberland Street, gaining a lot of public support and cheers. The image was clear, the message was clear, NO TO ANIMAL CRUELTY, NO TO HLS! Shareholders, stockbrokers, market makers, suppliers and clients have all dumped HLS, including the world’s largest companies; all four main high street banks in the UK, the world’s largest financial institution, the world’s second largest bank and the world’s largest insurance broker. Huntingdon are $72 million dollars in debt with NO commercial bank and insurance company anywhere in the world prepared to deal with them.